I made this salad for Festivus last week. We hosted it at our house this year. It was a bold move (the salad choice, not hosting it at our house), as our Festivus is celebrated among The Stallion's high school friends, and an arugula salad is not what one would think of as a plausible menu item for a crowd of boys. I snuck it in there with Italian Roast Beef Sandwiches and Grown Up Mac 'n' Cheese (with bacon and caramelized onions), so don't worry about them. We erected an aluminum pole in our front yard. As always, the airing of the grievances was.... entertaining. It's unfortunate we now only see some of these guys at Festivus, but - that's life. And most times, it takes intention to keep friendships in tact. Friends move to towns inconveniently farther away, some get married and the dynamic changes, and increasingly often, we're finding, others have babies. It's no longer college where your friendships are easy because you all live 10 feet from one another. It's not your first job where your colleagues become your best friends because you're learning to build your careers together and it's guaranteed you'll see each other 5 days a week. You have to make the time to schedule the time, and you have to show up. We take the time every year to schedule Festivus. And, for the most part, everyone shows up. It's going to get more difficult as the years go by, but I hope this tradition continues well past the age where it might still be considered 'appropriate'. I do not want to think of the inevitable day when our children ask what Festivus is, which will inevitably be followed up with 'What's Seinfeld?'. But, alas, I just did. And it will happen. God help us all. I think next year I'll be asking for the complete Seinfeld boxed set. Too bad DVD players will likely be obsolete when the time comes to make my children watch Seinfeld. Maybe we'll be back to VHS by then - I hear hammer pants are coming back, too. So, back to the salad. This is a great winter salad. I was so taken aback by the boys swooning over it; I think it's safe to say it's been tested and approved. Of course, you can mix and match anything with this salad (mixed greens instead of arugula, blue cheese instead of ricotta salata, add candied walnuts, bacon instead of pancetta, dressing from your fridge door instead, and on and on and on), but really - then it's not this salad at all. This salad was merely the inspiration for making a salad with whatever you have lying around. But this salad recipe is perfect the way it is written. And it will take some intention to make happen (who has ricotta salata or champagne vinegar lying around?). Just like making time for friends, it takes some intention, but the reward totally makes it worth it. 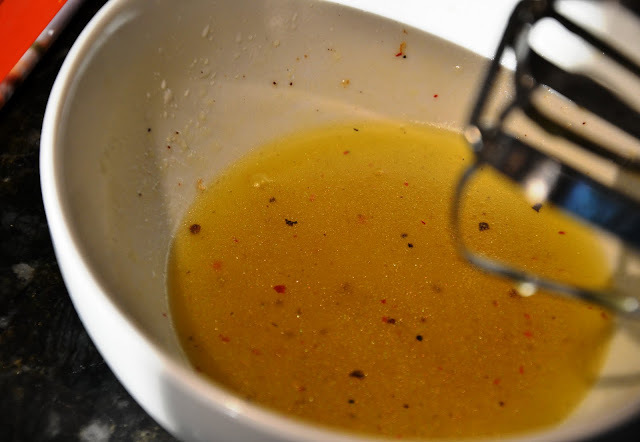 Whisk together vinegar, honey, lemon juice, salt, and pepper in a salad bowl. Add oil in a slow stream, whisking until combined well. I have a cruet that I use to make dressings. I just threw all of the ingredients in there and shook it up. Make sure the lids on all the way first, though, or you'll be making a last-minute wardrobe change because you got oil all over your sleeve. Cook pancetta in oil in a heavy skillet over moderate heat, turning frequently, until just crisp, about 5 minutes. Transfer to paper towels to drain (pancetta will crisp as it cools). Tear into bite-size pieces. Halve pears lengthwise, core, and cut lengthwise into 1/4-inch-thick slices. 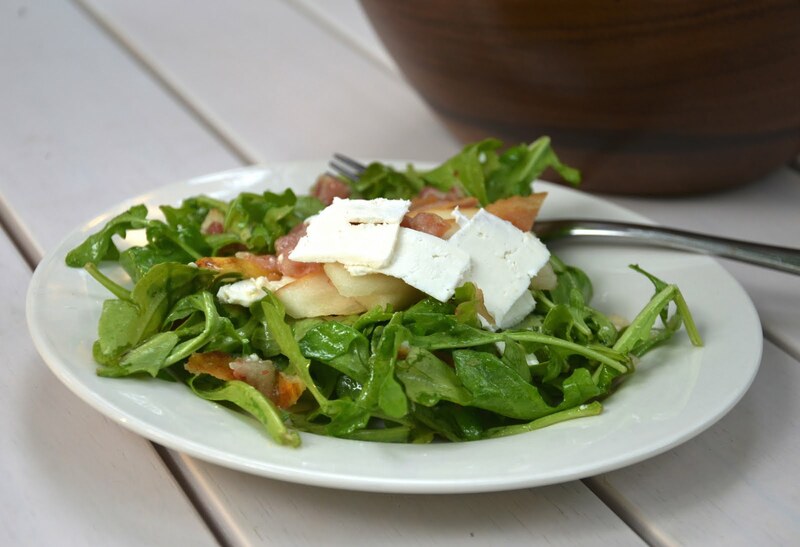 Add pears to dressing along with arugula, cheese, and pancetta, tossing to coat. Great salad. 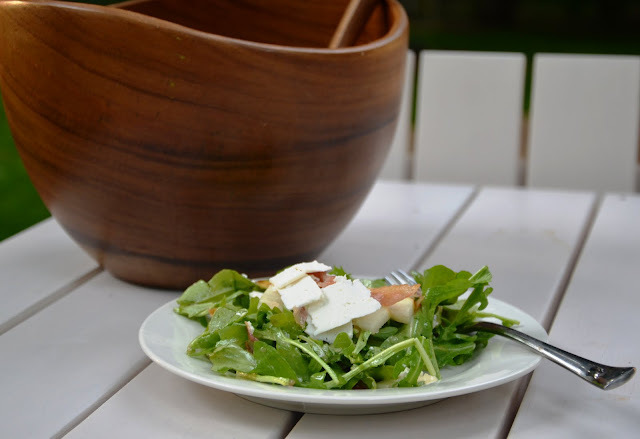 I love the combo of pears and arugula.